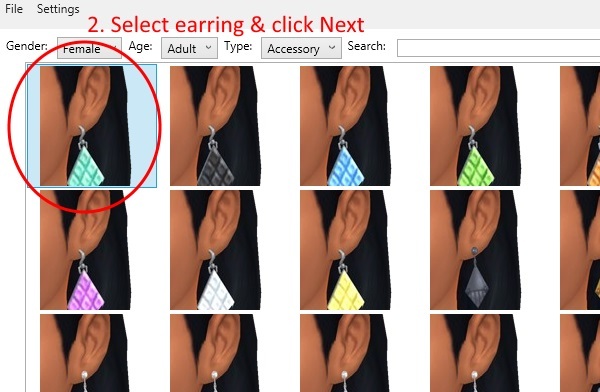 This tutorial will show you how to create your own new Sims 4 earrings using Sims 4 Studio and Blender. It will go over making a new mesh and texture, mapping the new mesh for Sims 4, sizing and positioning the new mesh correctly, preparing the mesh for the game, and importing mesh and texture into a .package correctly and making a new color choice (swatch) for it. While the tutorial looks long none of this is very tough. This is a very basic tutorial and is not meant to demonstrate expert, or even intermediate, techniques. 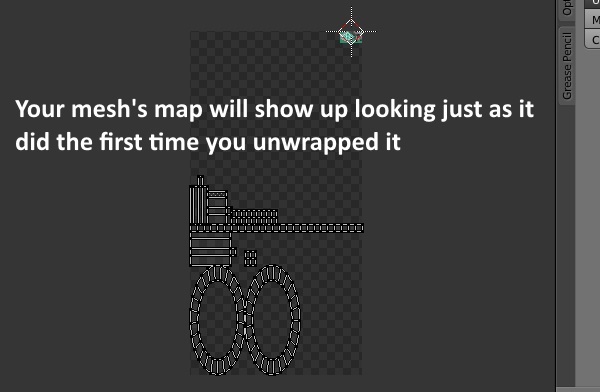 Once you've done it though you can move on to learning more advanced meshing and mapping skills. 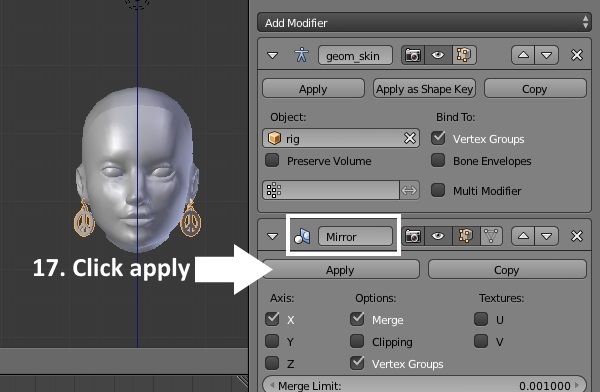 The tutorial goes over several basic features of making a mesh using Blender. 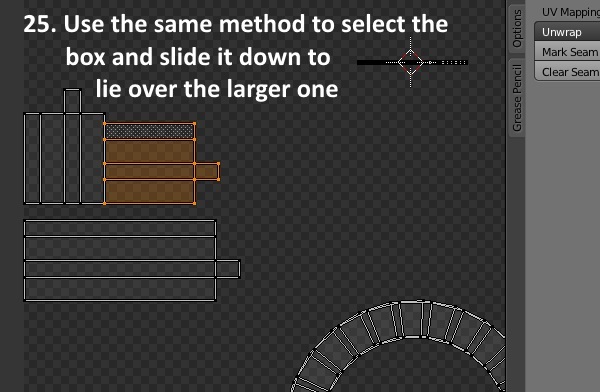 Wherever a Blender keyboard shortcut is used I have illustrated that using a picture of the key and I have listed the shortcut and what it does below the picture showing that step. One vital Blender shortcut is Ctrl + Z. Clicking Ctrl + Z will undo the previous step. If you run into questions please post in the thread below rather than PM'ing me...if you have a question undoubtedly someone else wants to know the same thing so it helps to have questions posted. 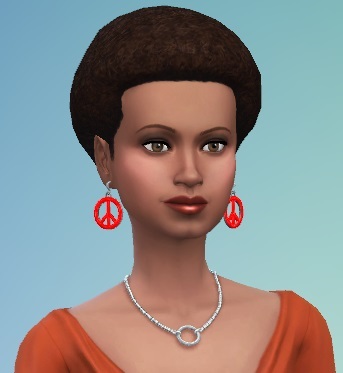 When you finish the tutorial I'd love to see some pictures of your earrings. Feel free to post them in this thread. 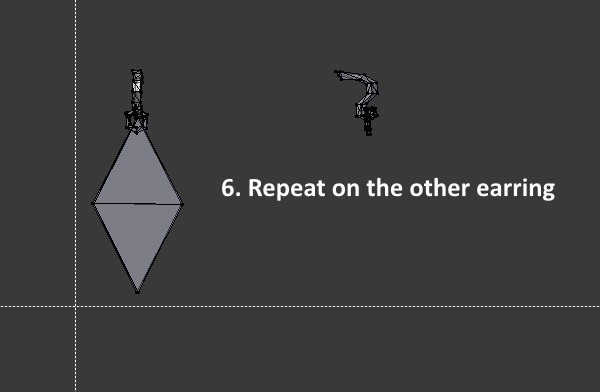 As you work through the steps of the tutorial save often. I usually change the name I save as so that if I've made a big mistake I can fall back to a previous version of my item that was saved prior to the mistake. 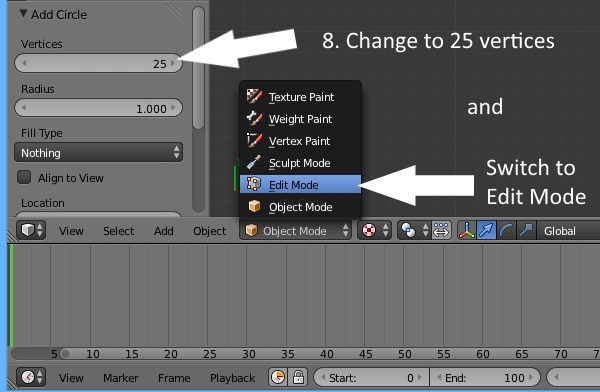 The Blender .blend you import back to Studio does not need to have the same name as the one you exported from it. 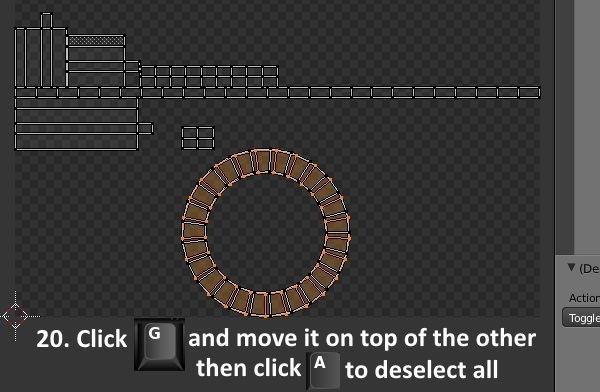 A 2D editor. I use Paint.net but any 2D editor that can manage .dds DXT5 (interpolated alpha) will do. 1. 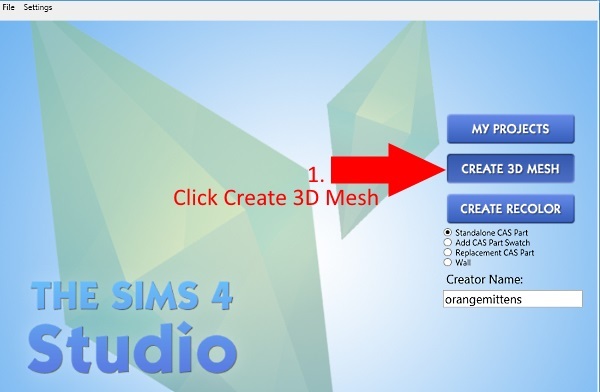 Click the Create 3D Mesh button. 2. Select the first earring on the Adult Female Accessory list and click Next. 3. Click the Meshes tab. 4. LOD 0 is present by default. This is the high Level Of Detail mesh that is seen by players viewing the Sim at close range. 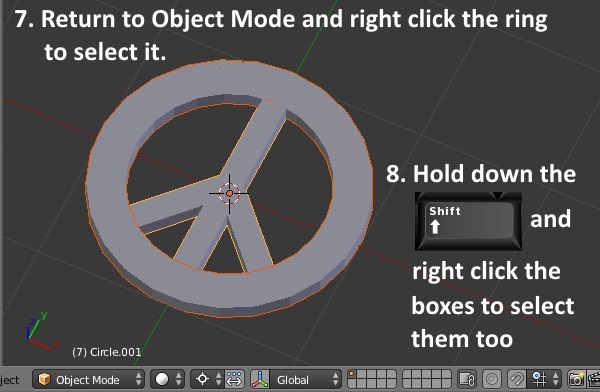 Click the Export 3D Mesh button. 5. On the right side you will see the Scene outline. 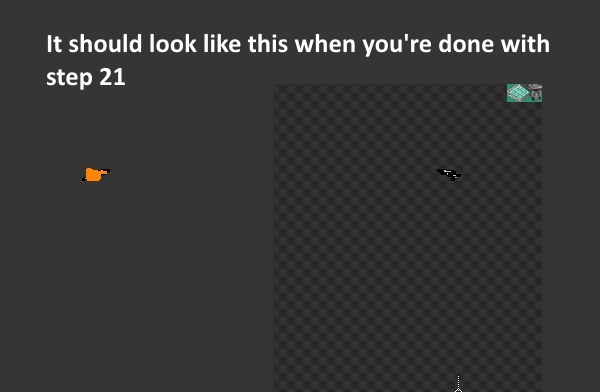 Click the + next to the rig to expand it. 6. Once it has expanded you will see all the parts of the model and the EA earring mesh. 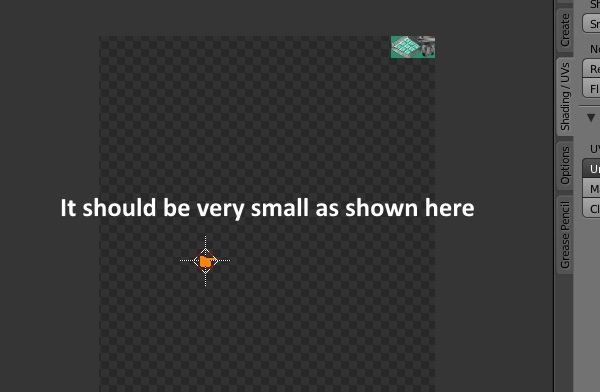 Click the small eye icons to the right of their name and they will disappear in the viewport window. 7. Below the viewport window on the left you will see the word Add. Click that to open the menu. 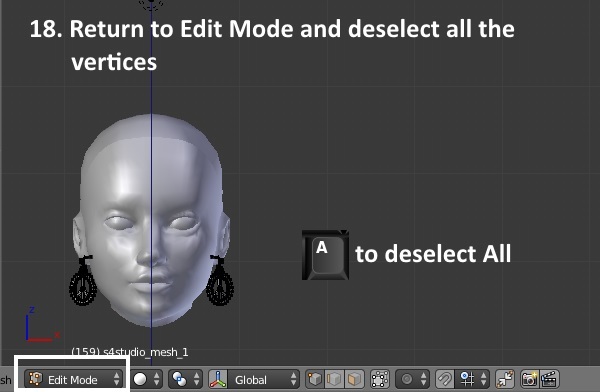 Select Mesh and when the submenu pops up select Circle. 8. 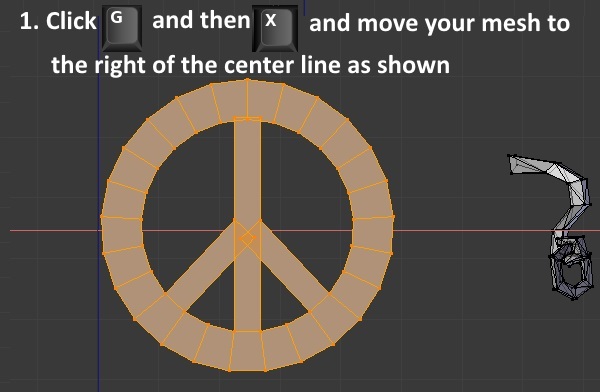 Before doing anything with the circle look to the left side of the viewport window to find the Add Circle menu that is associated with the circle you added. Change the number there to 25. Now switch to Edit Mode. This can be done from the menu shown below or you can hit the Tab button on your keyboard. 9. 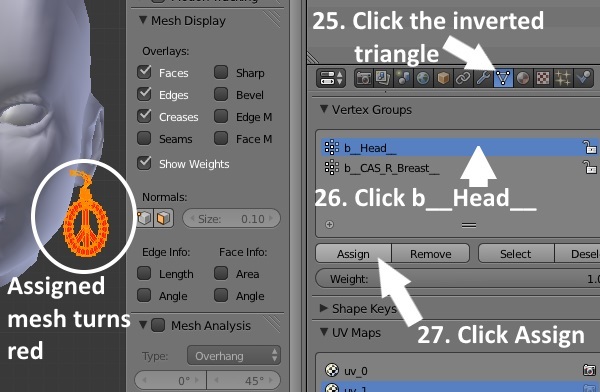 Click the E key on your keyboard to initiate the Extrude process. 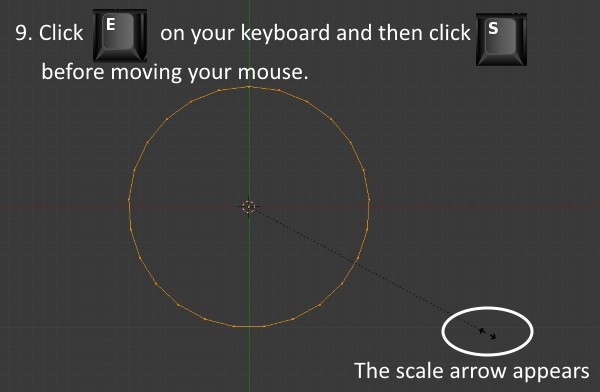 Before moving your mouse at all click the S key on your keyboard to modify the Extrude process with Scaling. You should then see the scale arrow appear as shown below. scaled extrusion process when you are satisfied with the ring's appearance. 11. Hold down the Alt key on your keyboard and simultaneously hold down the Shift key. 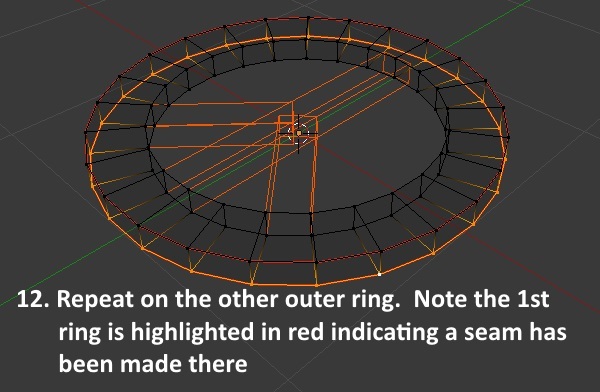 Then right click anywhere on the outer edge of the ring between two vertices. This will select the outer ring edge while keeping the inner ring edge selected too. When both ring edges are selected the ring will turn orange. 12. 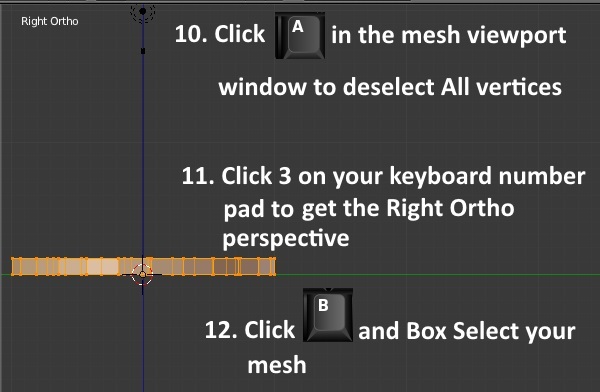 Click 1 on the number pad to switch to the Front Ortho view. 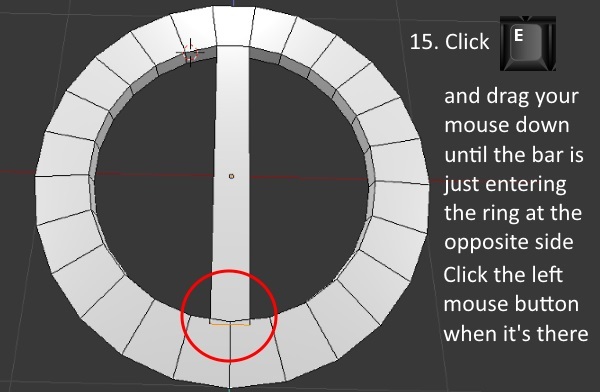 Click E again (to extrude) and slide your mouse so that the top of the ring moves upward. Again, click the left mouse button to terminate the extrusion process when the ring is roughly as thick as the ring shown below. 13. Now hold down the Ctrl key on your keyboard and press 1 on the number pad. 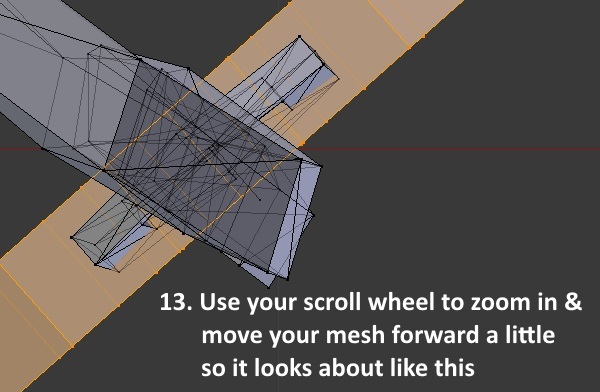 This will spin the view around so you are looking at the mesh from behind instead of from in front. Tip the view a little so you can see the inner faces of the ring as shown. 14. Click the Face Select button that is in the bar below the viewport window. Then right mouse click the face that is directly on top of the green line. button to terminate the extrusion process. 16. 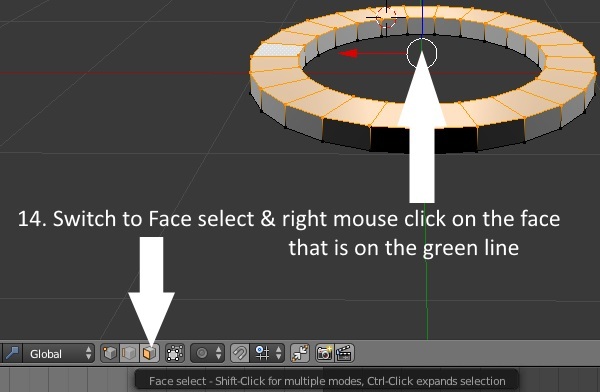 Now right mouse click on one of the faces that is 2 faces from the previously selected face. 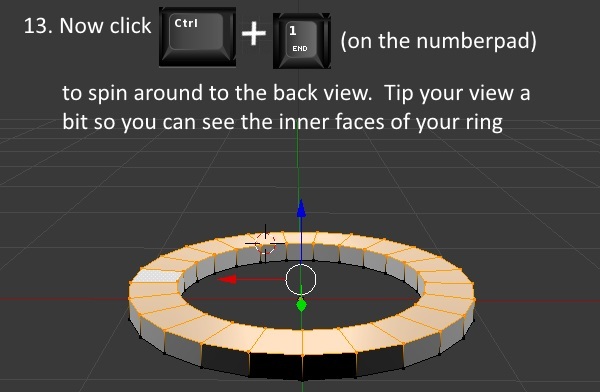 Click E again and drag your mouse so that the face moves toward the center of the ring. 17. Switch back to Object Mode using the same mode menu you used before or by clicking the Tab key on your keyboard. You will see how your mesh appears without any texture on it. 2. 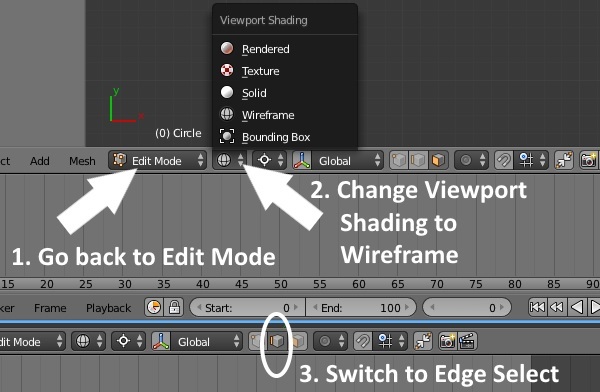 Change the Viewport Shading to Wireframe. 3. Switch to Edge Select. 4. Hold the Shift key down while selecting each edge of one of the boxes so that the entire thing turns orange. 5. Continue holding down the Shift key while repeating this step on the other two boxes. 6. 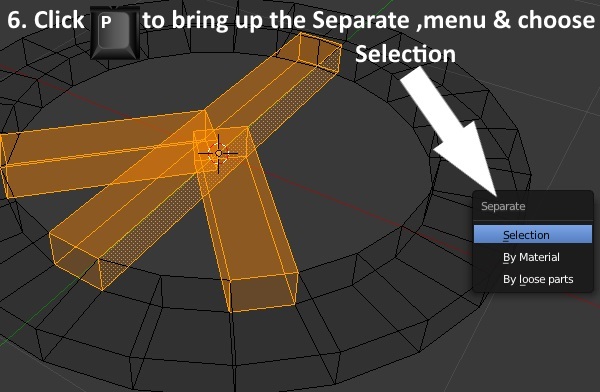 Click the P key to bring up the Separate Menu and choose Selection. 7. 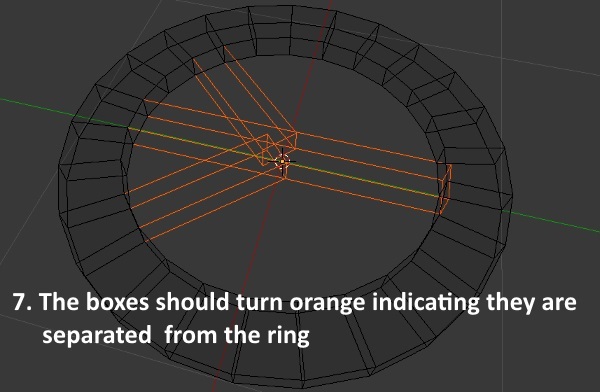 Once you click Selection the boxes should turn orange indicating they are separated from the ring as their own mesh. 8. 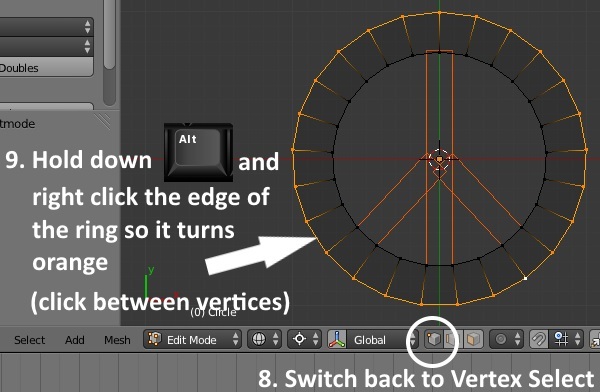 Switch back to Vertex Select. 9. 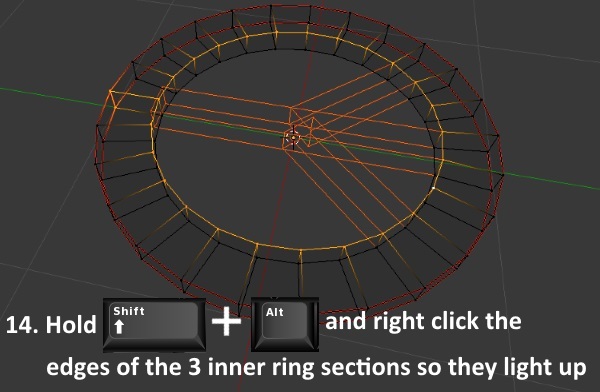 Hold down the Alt key and right click between two vertices on the edge of the ring to select it. 10. 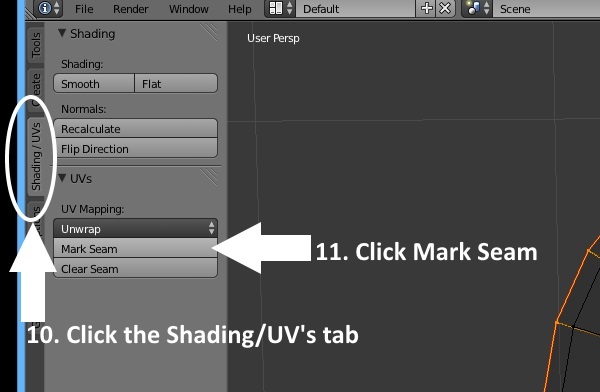 Click on the Shading/UV's tab which is on the left side of the viewport screen near the top. 11. Click the button that says Mark Seam. 12. Repeat on the second outer ring. Note that the edge you already marked has turned red indicating that this edge is marked with a seam. 13. Hold down the Shift key and right mouse click on each of the two vertices on the outer edge centered across from the long box. When both are selected an orange line will appear between them. When you see the orange line click Mark Seam. 14. Hold down the Shift key and the Alt key and right mouse click on each of the three sections making up one of the inner ring edges. 15. Click Mark Seam and then click the A key on your keyboard. You will see the edges become deselected. 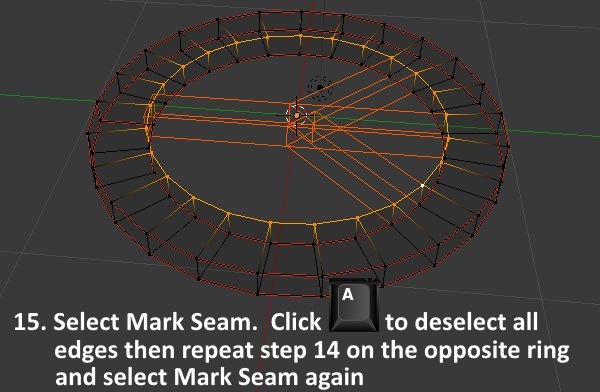 Once the edges are deselected repeat step 14 on the second inner ring and then click Mark Seam again. 16. 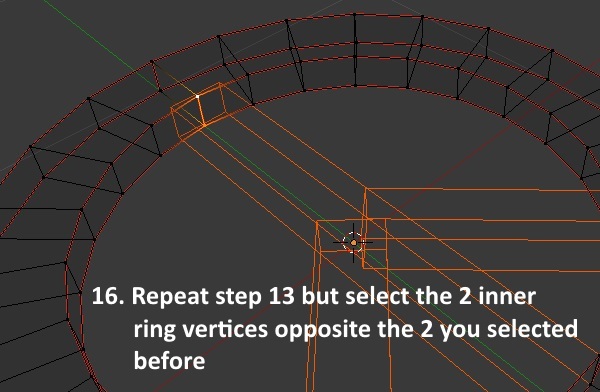 Repeat step 13 but select the two inner ring vertices that are on the opposite side of the ring from the ones you selected before. 17. 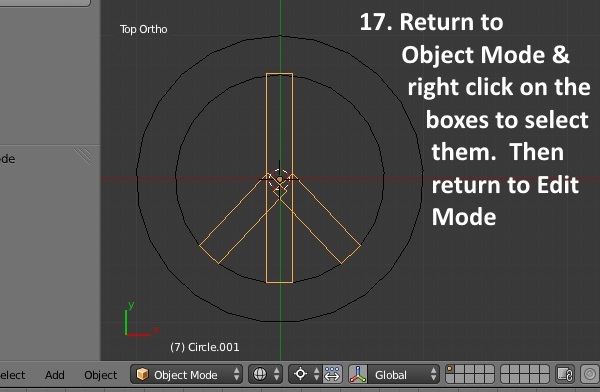 Return to Object mode and right mouse click on the boxes mesh group to select it. Then return to Edit mode. 18. 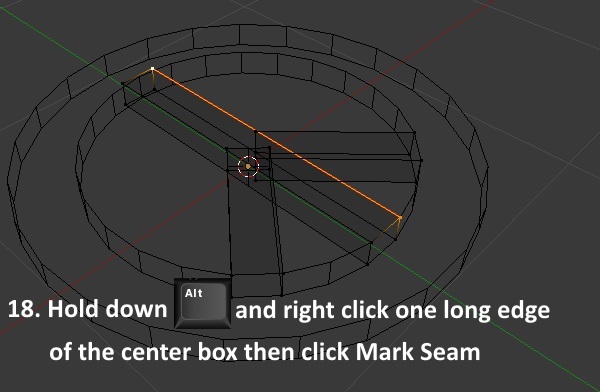 Hold down the Alt key and select on of the long edges of the center box. Click Mark Seam. 19. 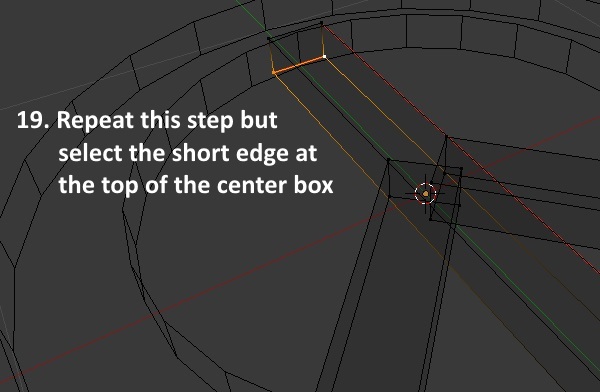 Repeat this step but select the short edge at the top of the center box. of the box (the portion that is inside the ring) is not marked as a seam. 21. 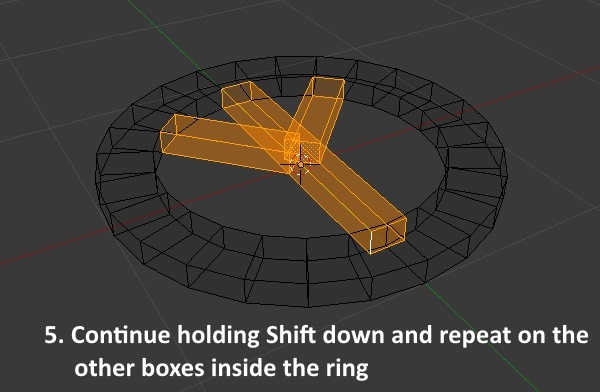 Repeat steps 18-20 for the other two boxes inside the ring. 1. Return to Object Mode using the Tab button on your keyboard or the menu that was shown above. 2. 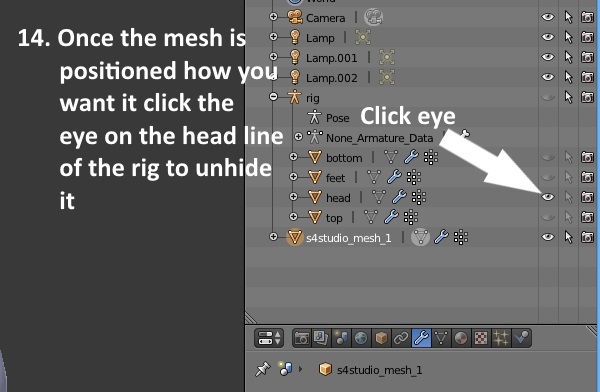 Click the eye icon across from s4studio_mesh_1 to unhide the mesh. 3. 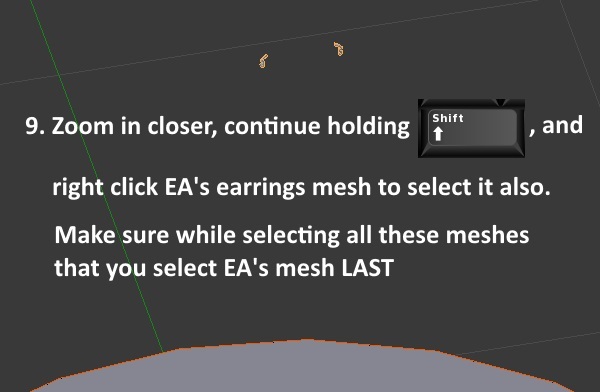 Right mouse click on the EA earring mesh to select it. It will get an orange outline around it when it is selected. Then return to Edit Mode. 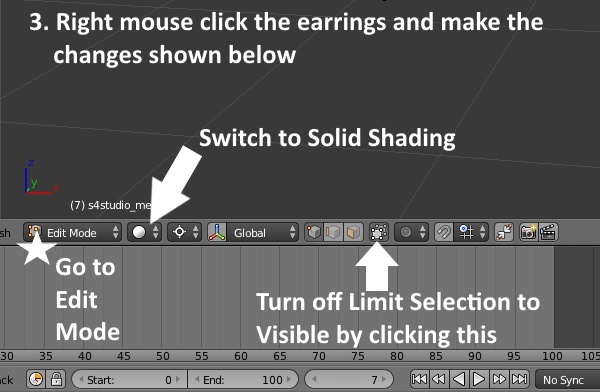 Switch to solid shading and turn off Limit Selection To Visible. 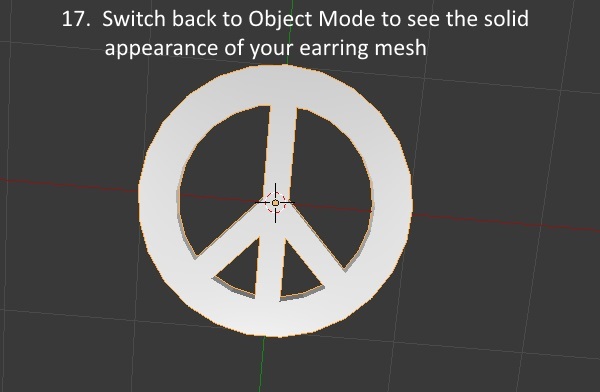 This will allow you to see and select vertices that are hidden behind the solid shaded mesh. the earring as shown below. 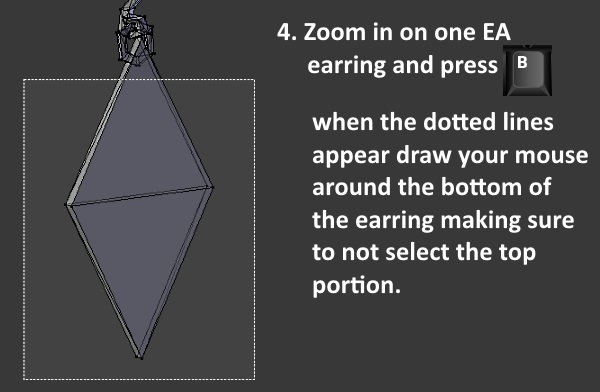 Make sure not to select the top of the earring because this will be retained as part of the new mesh. 6. Repeat on the other earring. 7. 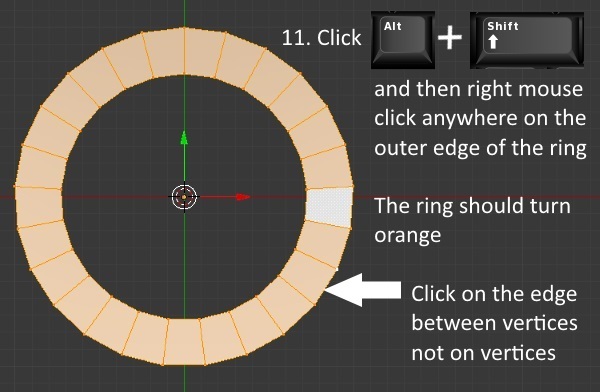 Return to Object Mode and right mouse click the ring to select it. 8. Hold down the Shift key and right mouse click the boxes to select them too. 9. 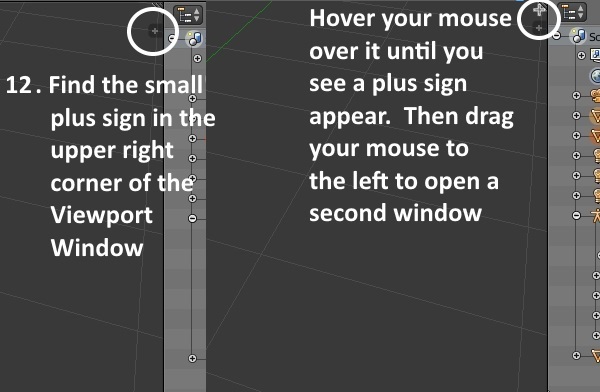 Use the middle scroll wheel to zoom in closer and, with the Shift key still held down, right mouse click EA's earrings mesh to select it too. 10. Hold down the Ctrl key and click the j key on your keyboard at the same time. This will cause the 3 mesh groups to be Joined into a single mesh group. 11. Return to Edit Mode. 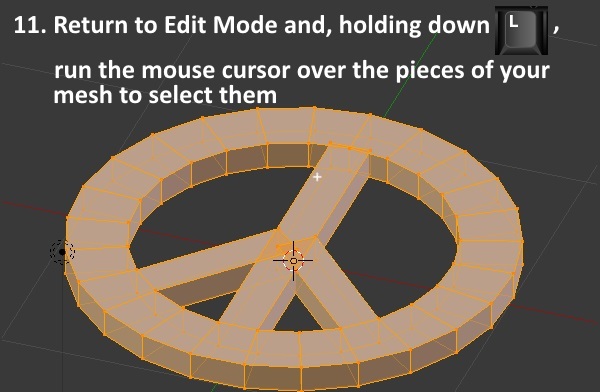 Hold down the L key on your keyboard while running the mouse cursor over the pieces of your mesh. They will turn orange as they are selected. your mouse to the left. As you slide the plus sign over you will see a second window open up. 13. Look in the bottom left corner of the window on the right side and you will see a small white cube. Click on that to open the Editor Type menu. 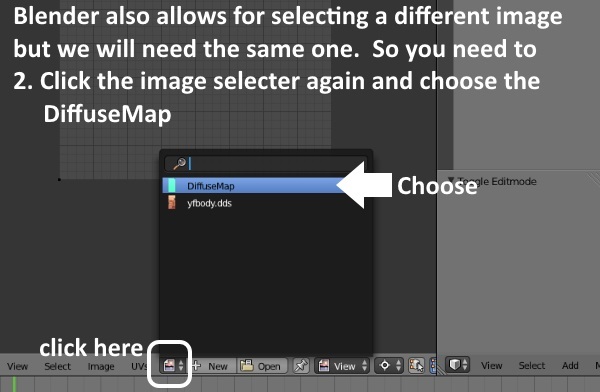 Select UV/Image Editor. 14. Now on the tab that you previously opened (which will lie in the middle between the two windows) click Unwrap. This will bring up a menu. Select Unwrap. 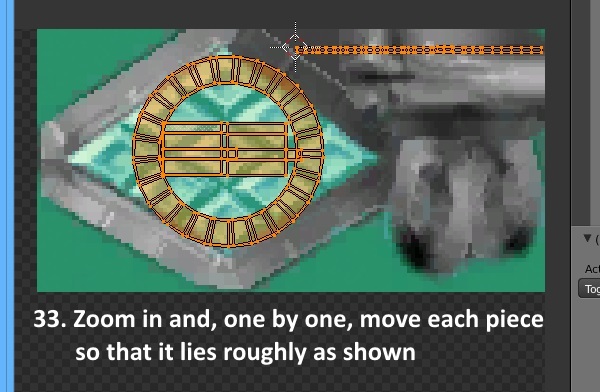 You will then see your mesh's map appear in the UV/Image Editor window on the left. 15. 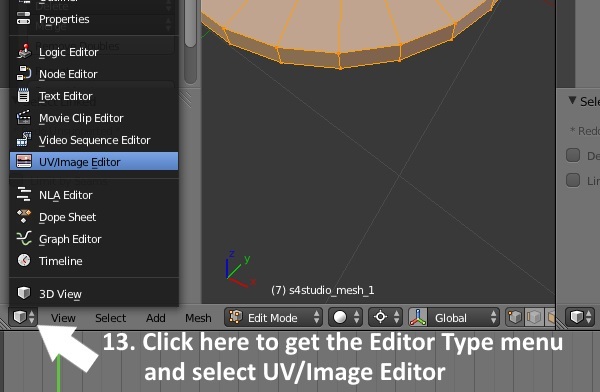 Click the small up/down triangles to the right of the plus sign in the bar below the UV/Image Editor window. 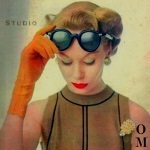 This will open a list of the images in the .blend. 16. 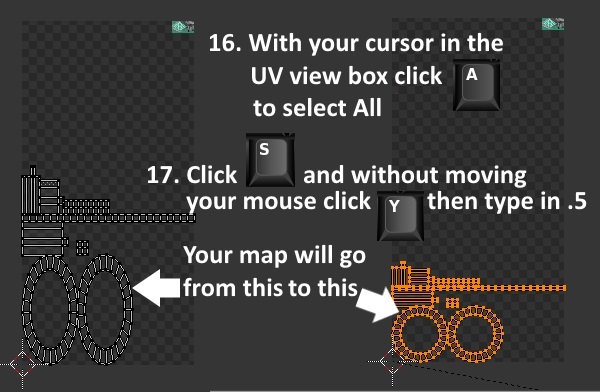 Place your mouse cursor in the UV/Images Editor viewport and click the a key on your keyboard to select All. 17. 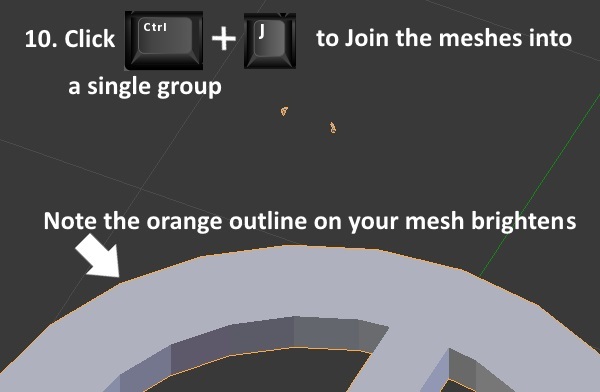 Once the vertices turn orange click the s key on your keyboard followed by the y key. Then type in .5. This will scale your map as shown below. 18. 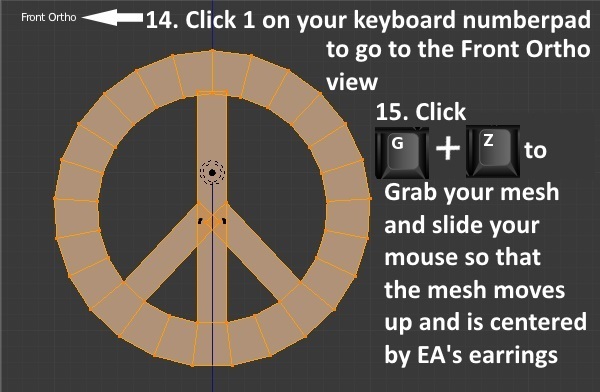 Use the middle mouse wheel to scroll the view closer and click the a on your keyboard to deselect all vertices. 19. 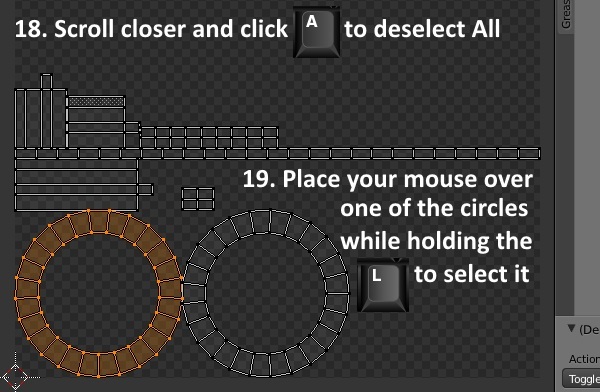 Place your mouse over the ring on the left and hold down the l key on your keyboard to select it. 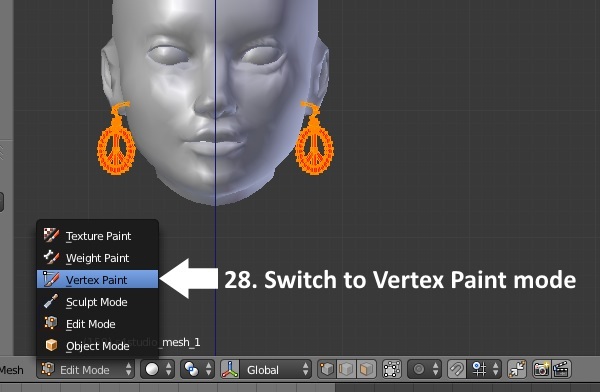 **Blender Shortcut used: l - will select linked vertices. 20. Click the g key on your keyboard and slide the ring so that it is on top of the other one. 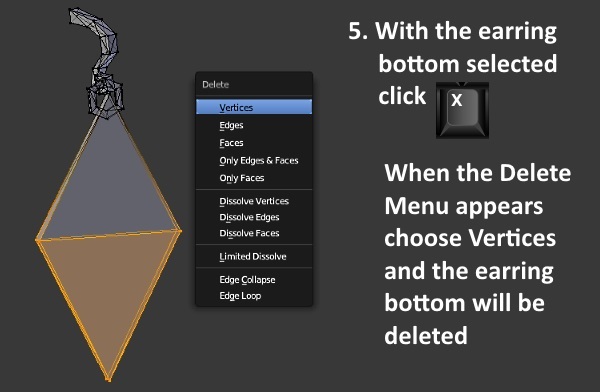 Then click a again to deselect all vertices. 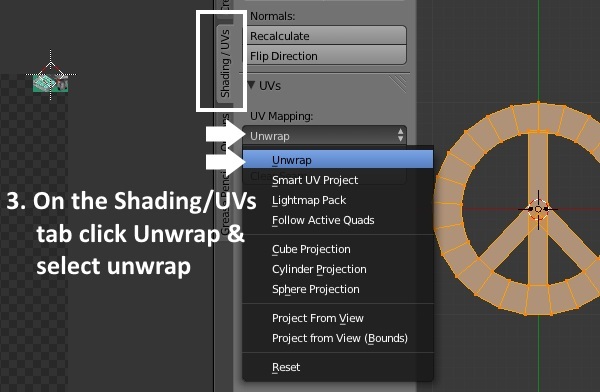 **Blender Shortcut: g - will grab selected vertices in the UV/Image Editor allowing you to move them. 21. 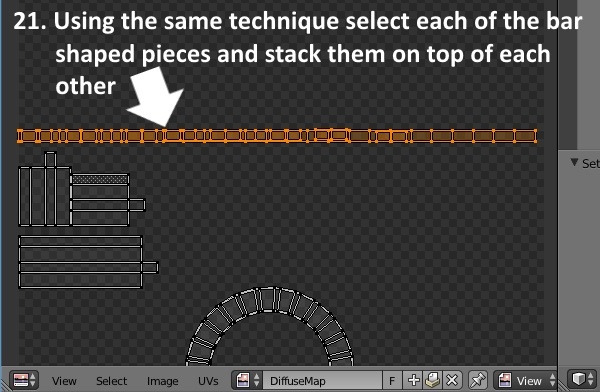 Using the same steps select each of the bar shaped pieces and stack them on top of each other. 22. 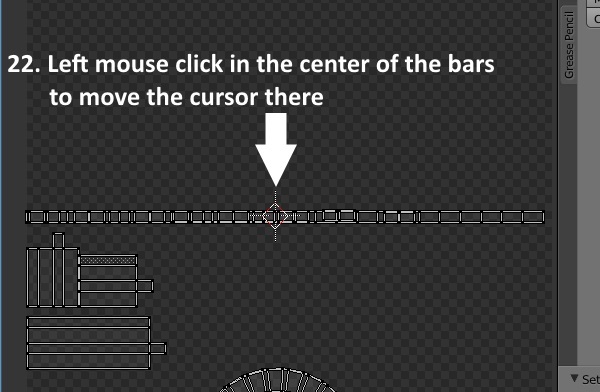 Place your mouse cursor in the center of the bars and then click the left mouse button. The cursor will move to where your mouse cursor is. 23. Click the b key on your keyboard and move the box around all the bars to select them. 24. 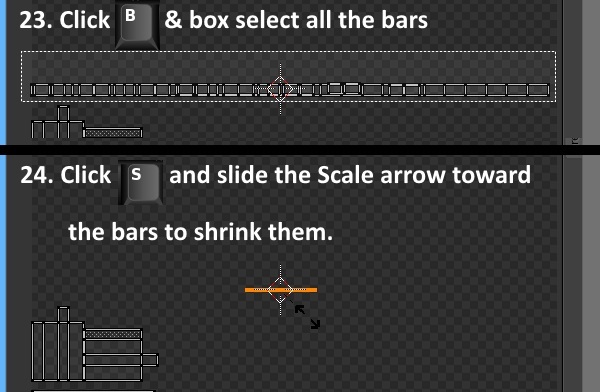 Click the s key and slide the scale arrow towards the bars to scale them down. until they are very small as shown below. 25. 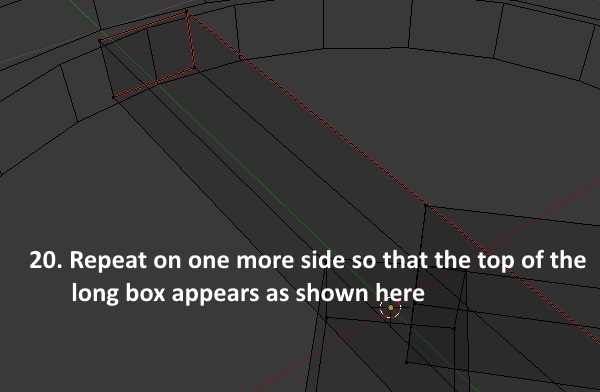 Use the same method to select the unwrapped box vertices and slide this down to lie over the larger one. 26. 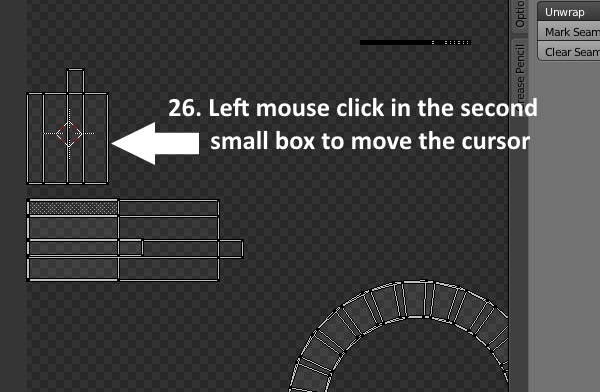 With your mouse over the second small box click the left mouse button to move the cursor there. 27. 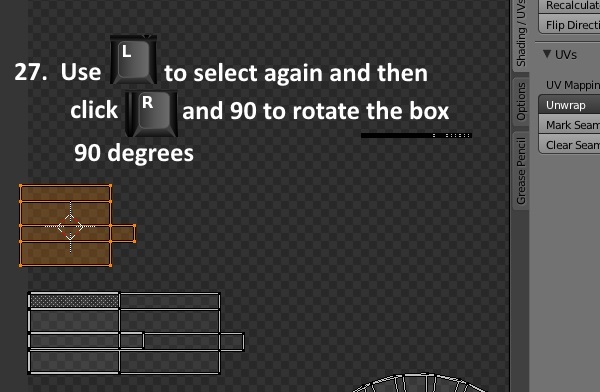 Use l to select that box and then click the r key followed by the number 90 to rotate the box 90 degrees. 28. 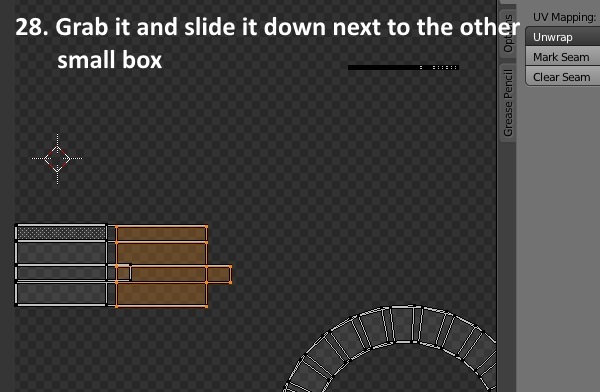 Now click g and slide the box down next to the other small box. 29. 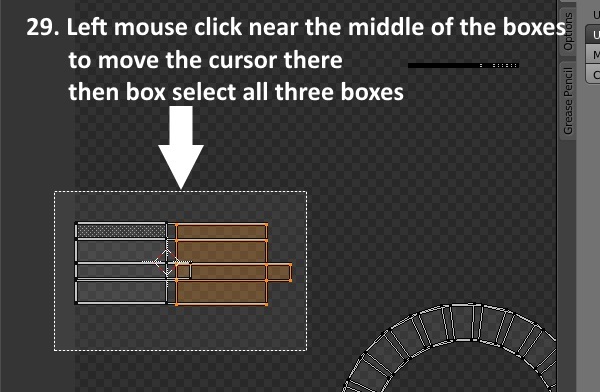 Left mouse click near the middle of the boxes to move the cursor there. Then click b and draw the selection box around all the boxes. 30. 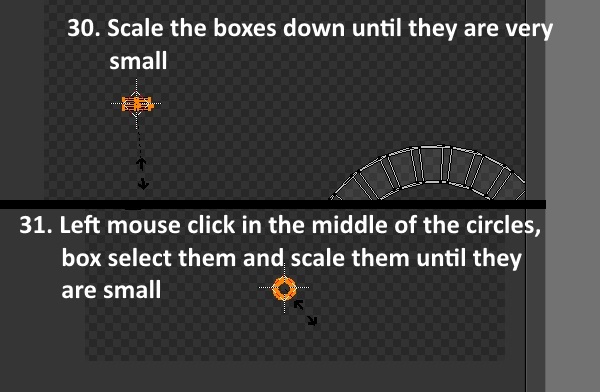 Click s and slide the scale arrow toward the boxes until they are scaled to a small size. 31. Perform the same steps on the rings. 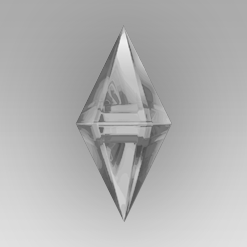 and, one by one, move them to the upper right corner near EA's original earring texture. 33. 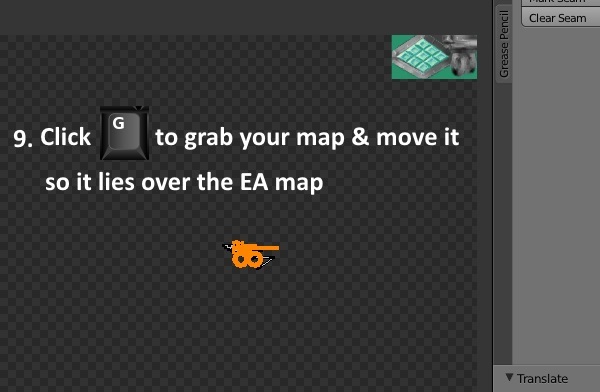 Now use the mouse wheel to zoom in and, one by one, move each so that it lies over EA's texture image as shown below. 1. 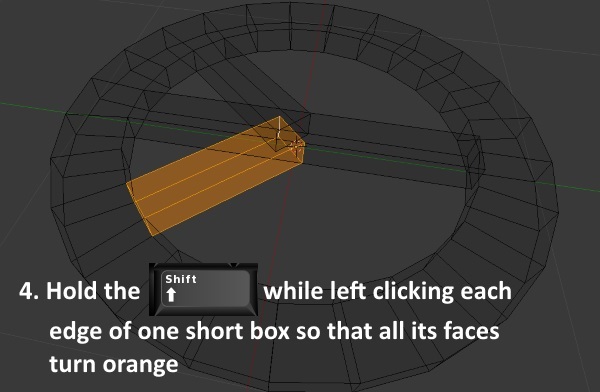 With the mesh still selected, click the inverted triangle on the right side of the viewport window. 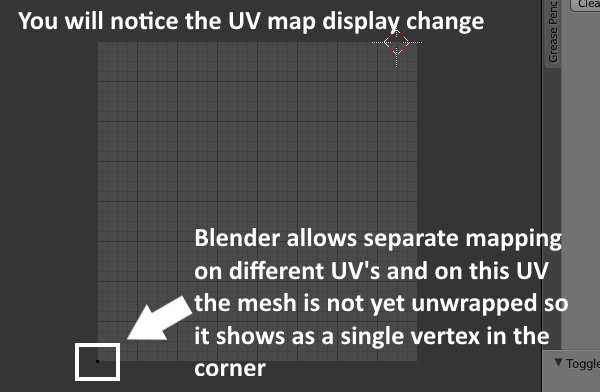 Go to the UV maps menu and click on uv_1. 3. Return to the Shading/UVs tab that we used before. Again select Unwrap and choose Unwrap from the drop down menu. 4. 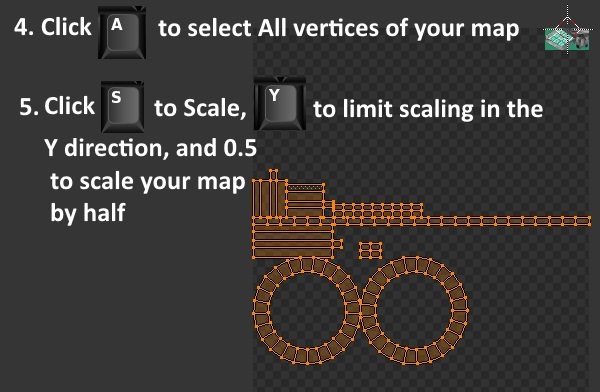 Click the a key on your keyboard to select all the vertices in your map. 5. 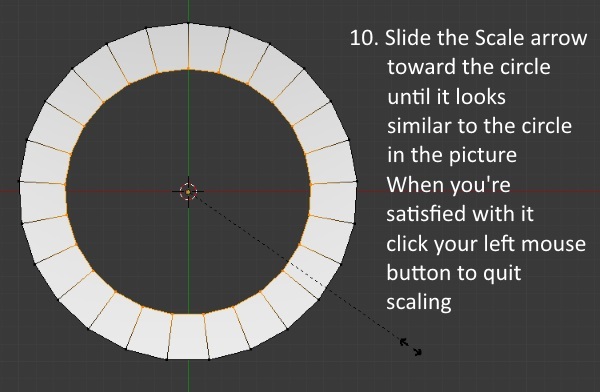 Click s to initiate scaling, immediately click y to limit scaling to the y axis only, and type in 0.5 to make the amount of scaling cause the mesh to become 1/2 the size it was in the y direction. 6. 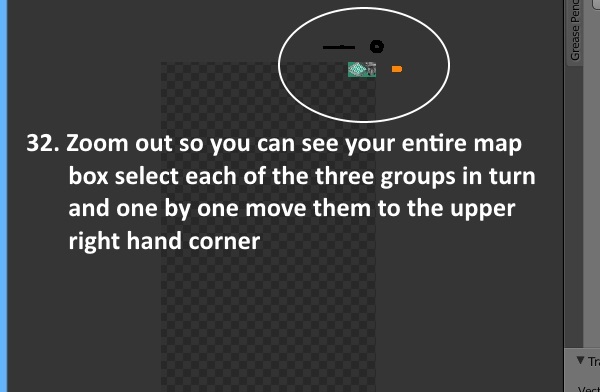 Right mouse click in the general vicinity of the middle of your map to move the cursor there. 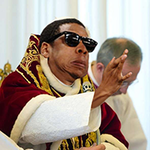 the cursor when you finish scaling. 9. 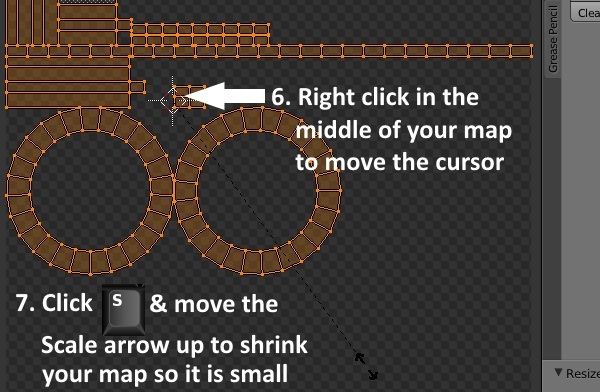 With your cursor hovering in the UV/Image viewport, click g on your keyboard to Grab your map. 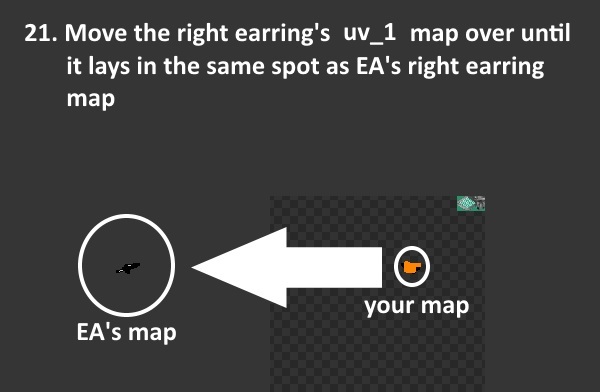 Move your mouse to slide your map up so that it lies on the EA map. 10. 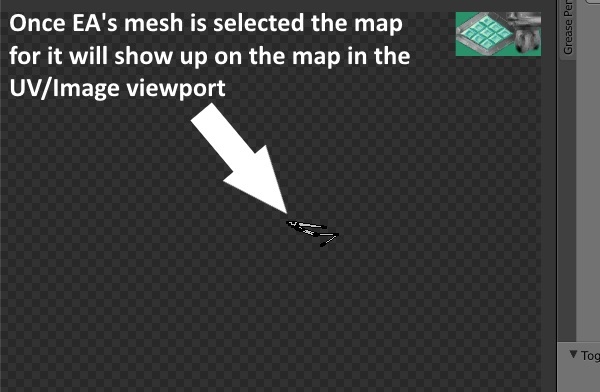 Return your cursor to the mesh viewport window and click A to deselect all the selected vertices. 11. 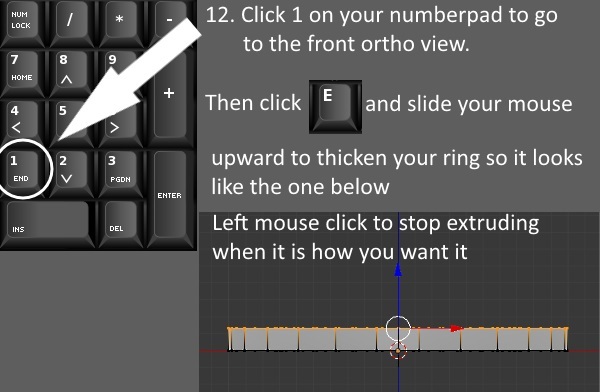 Click 3 on your keyboard number pad to get the Right Ortho view. 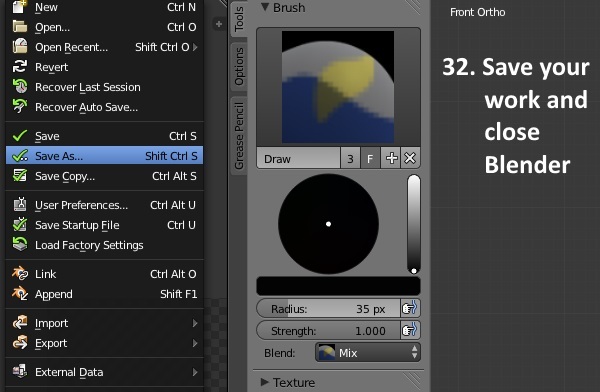 You will see the words Right Ortho in the upper left corner of the viewport window. 12. 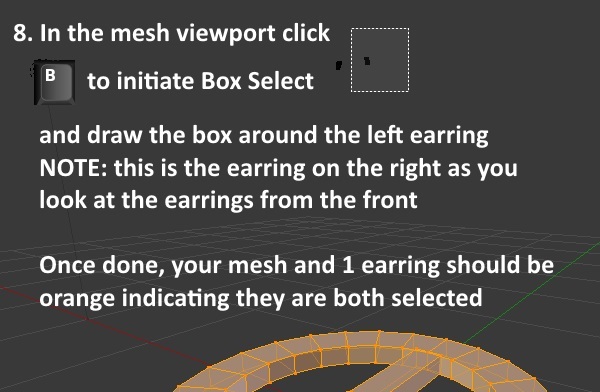 Click b to Box Select and draw the box around your mesh. around the X axis by 90 degrees. 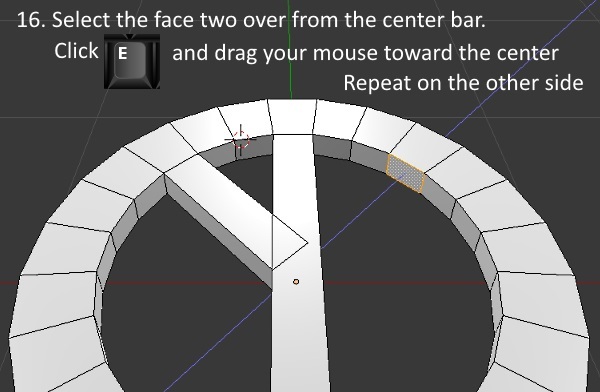 Once your mesh has rotated click the left mouse button to accept the new position and exit rotation mode. 14. 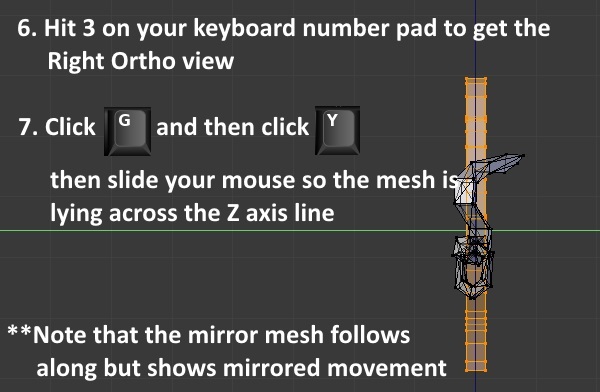 Click 1 on your keyboard number pad to go to the Front Ortho view. 16. 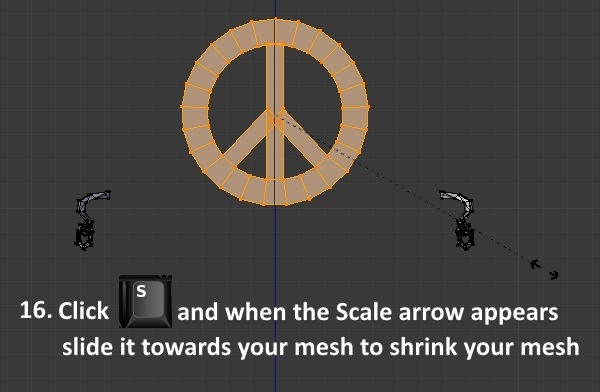 Click s on your keyboard and when the scale arrow appears slide it towards your mesh to make your mesh smaller. 1. 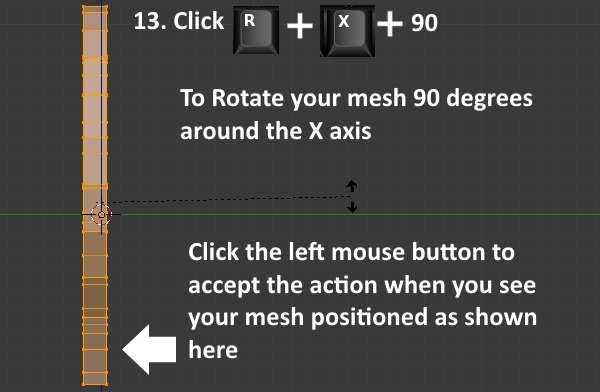 With your mesh selected click g on your keyboard to Grab it, immediately click the x key to limit motion to the X axis, and then move your mesh to the right of the blue Z axis line as shown. 2. Switch to Object mode. 3. 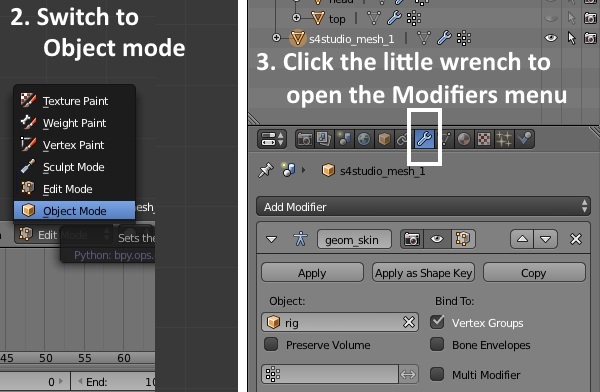 Click the little wrench on the right side of the screen to open the Modifiers menu. 4. 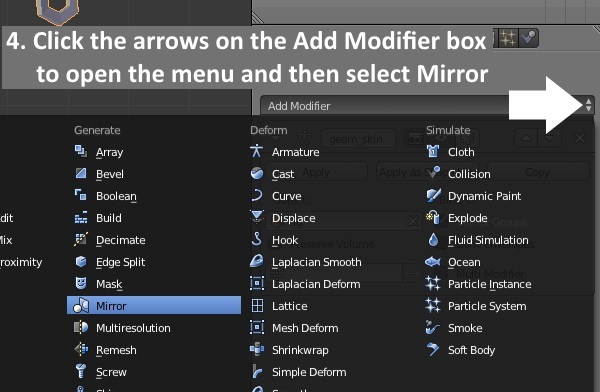 Click the arrows on the Add Modifier box to open the full menu and then select Mirror. 5. You will now see two meshes instead of one. 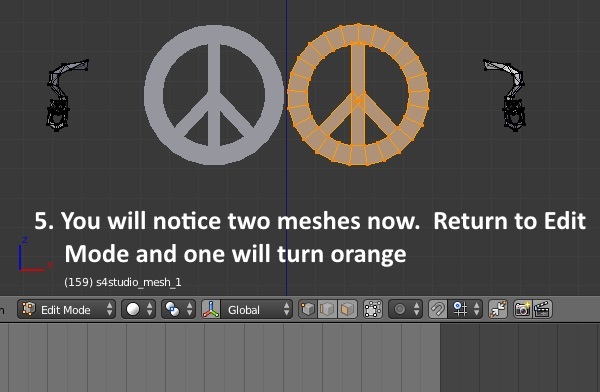 Return to Edit mode and the original mesh will turn orange. 6. Hit 3 on your keyboard number pad to go to the Right Ortho view. 7. 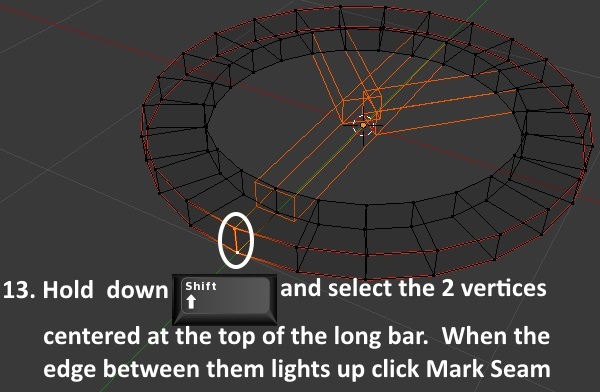 Click g on your keyboard and then immediately click y to grab your mesh and limit motion to the Y axis. 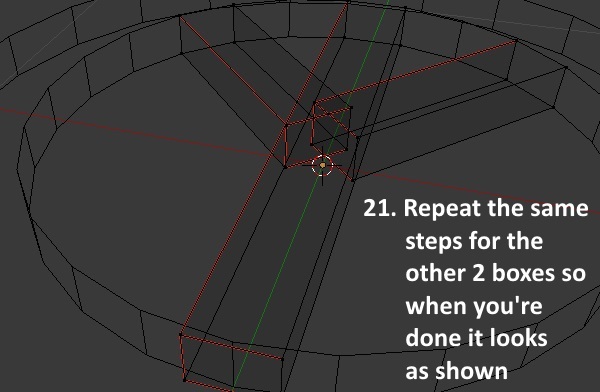 Move your mesh so it is centered on the Z axis line. 8. 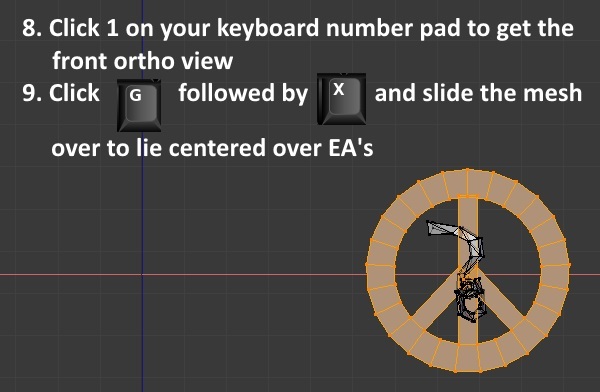 Click 1 on your keyboard number pad to go to the Front Ortho view. 9. 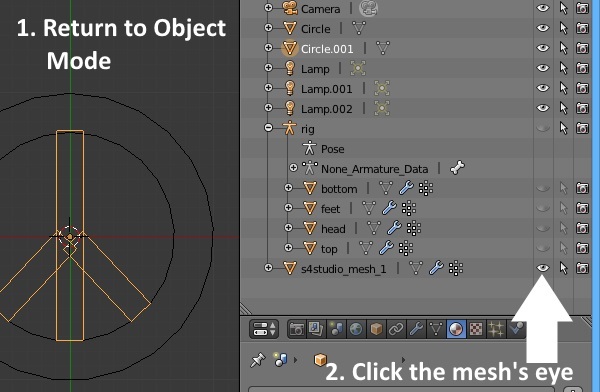 Click g followed immediately by x to grab your mesh and limit motion to the X axis. 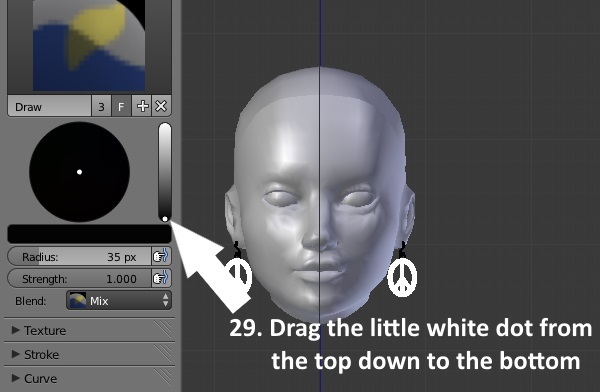 Then slide the mesh so it is centered over EA's earring top part as shown. embedded in the top of your mesh. 11. 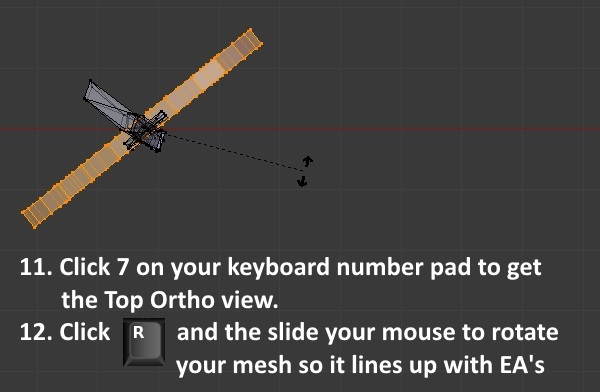 Click 7 on your keyboard number pad to go to the Top Ortho view. 12. 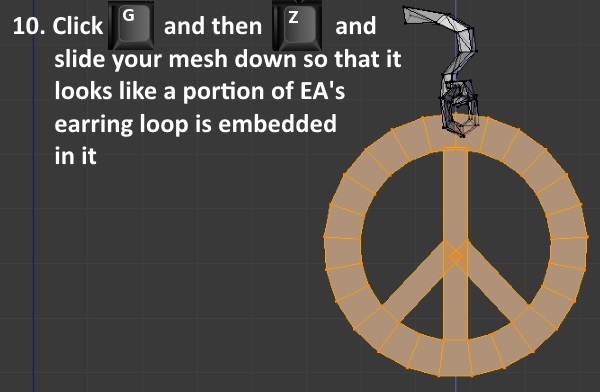 Click r on your keyboard and rotate your mesh so that it lines up with the rectangular bar portion of EA's mesh. 13. 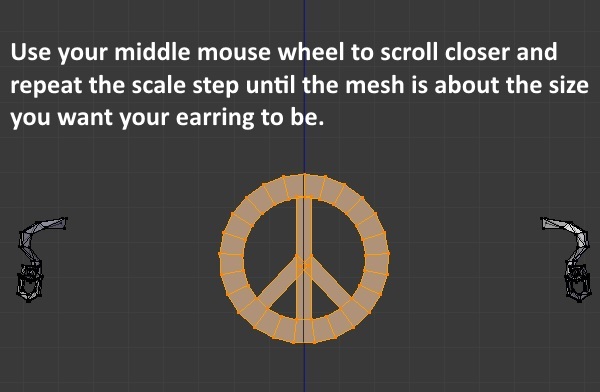 Use your mouse scroll wheel to zoom closer, click g to grab your mesh, and move it forward a little to center the bar of EA's mesh in the top of your mesh. 16. 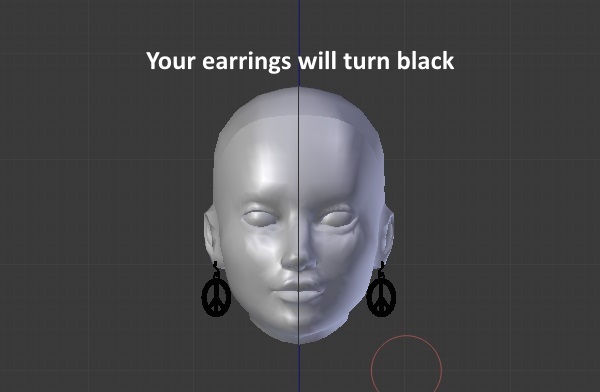 When you're sure your earrings are how you want them return to Object mode. 18. 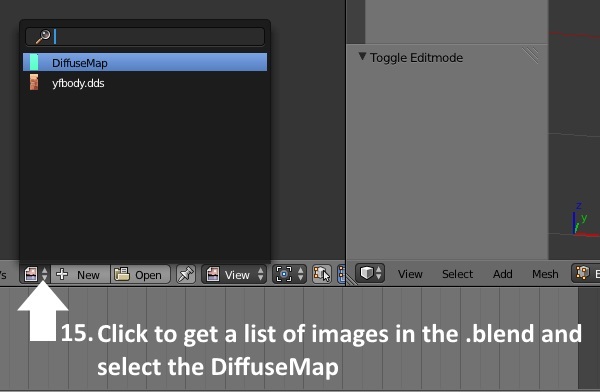 Return to Edit mode and deselect all the vertices (click a on your keyboard). 19. 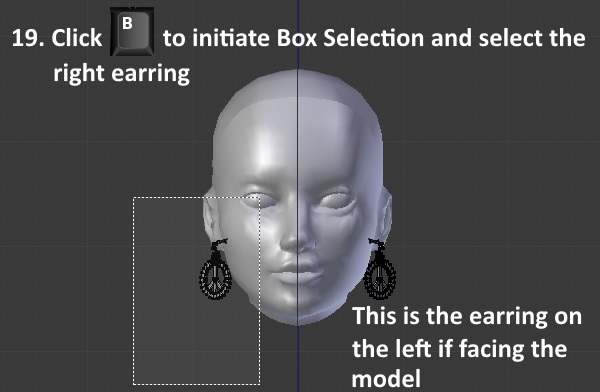 Click b on your keyboard to initiate Box Selection and draw the box around the right earring to select it. 20. 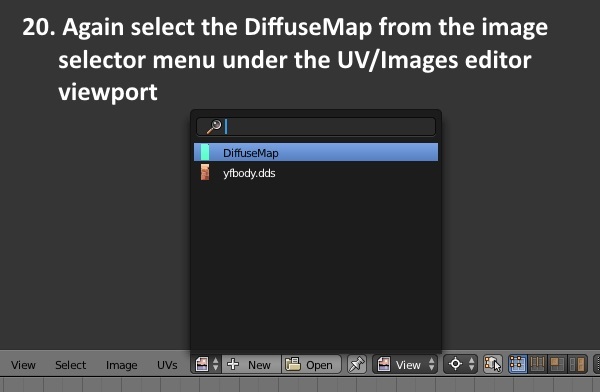 In the UV/Image editor area click the arrow to expand the selector menu and choose the DiffuseMap again. lying over the EA earring's map. 22. 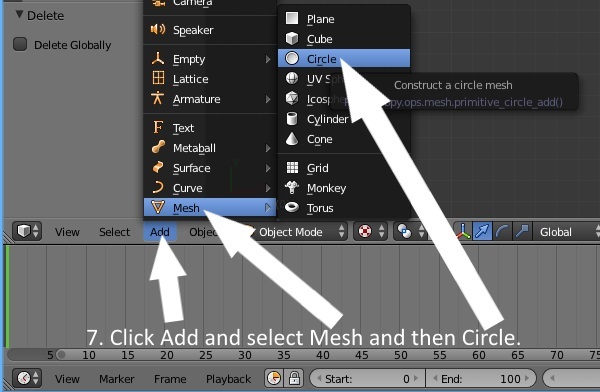 Select all the vertices in your mesh. 23. Click N which will bring up a menu bar on the right side of your 3D viewport. 24. Put a check mark in the box next to Show Weights. 25. 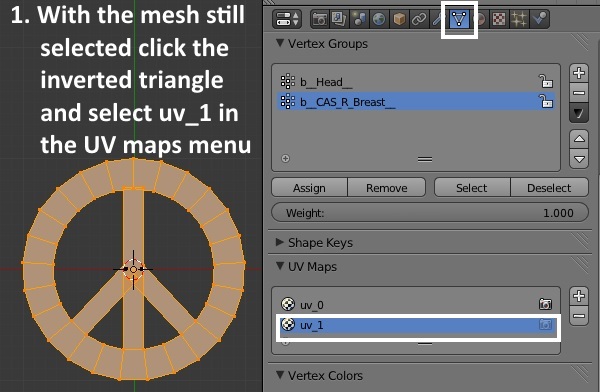 Click the inverted triangle on the right side to open up the Vertex Groups and UV's menu area. 26. Click on the Vertex Group named b__Head__ to select it. 27. Click the Assign button below the Vertex Groups box. 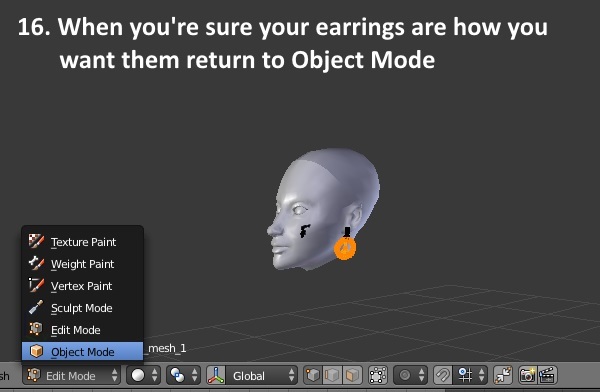 When you click the assign button your selected earrings mesh will turn solid red indicating 100% assignment to the head joint. color EA uses for earrings to make sure ours will move appropriately with the head slider. 29. In the upper left corner you will notice a small slider that is white at the top and black at the bottom. Use your mouse cursor to drag the small white dot at the top of this slider all the way down to the black part at the bottom. When you do the circle to the left will turn black. 30. Click the word Paint in the bar below the viewport window. 31. 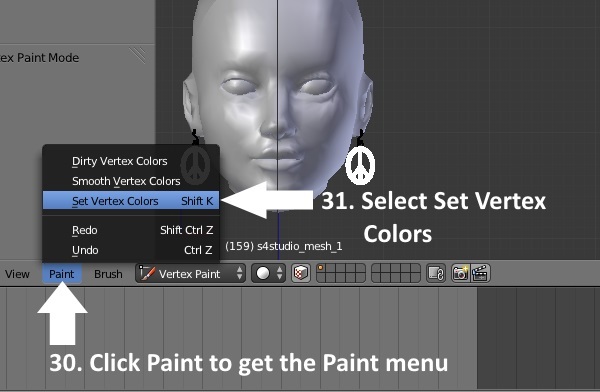 Select Set Vertex Colors from the popup menu. Once this is selected you will see your earrings turn black. 32. Your main mesh is now finished and you can save your work. Close Blender. hey, I don't if there's a thread for questions about this tutorial so I'm asking here. 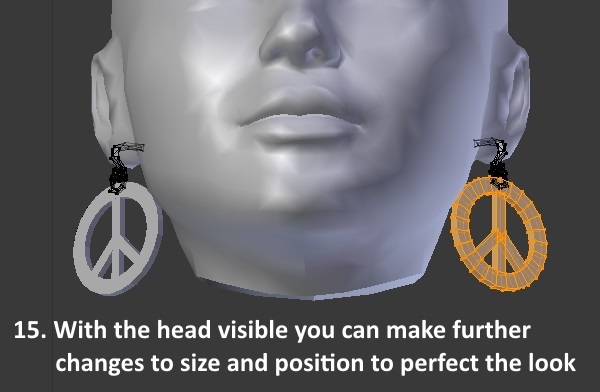 When I turn on visibility for the ea earrings in part 3 the earrings don't show up. what am I doing wrong? This is the right thread for questions about the tutorial. Which step are you on? Sorry for my stupidity, but... How do I export the 3d mesh with S4S 2.1 (Alice)? 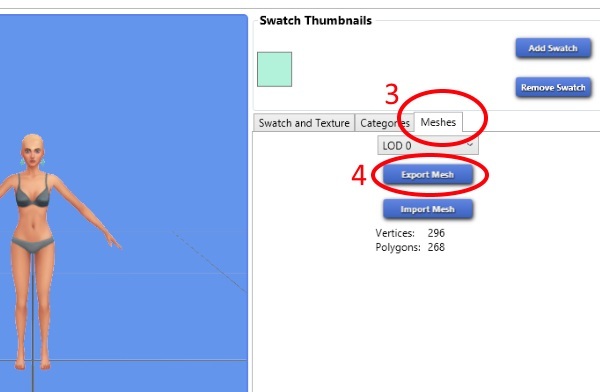 On the model viewer screen you will see the Meshes tab. 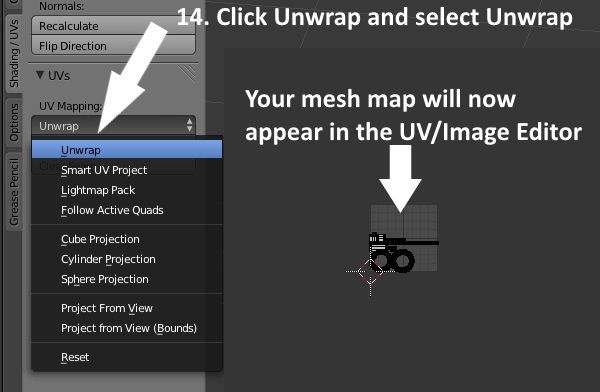 Click that and when the Meshes page opens click the Export button. 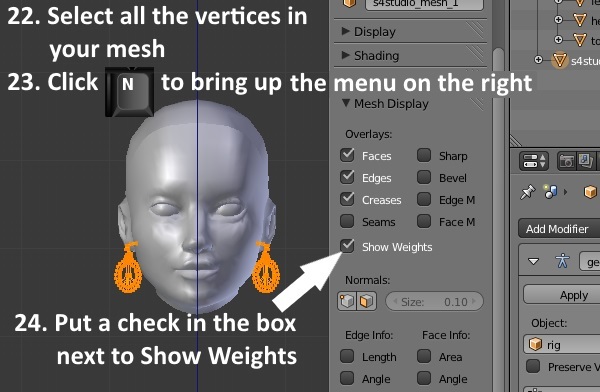 The Meshes tab has moved lower on the page than it used to be so I've update the screenshot in the tutorial. It should look like what you see using Alice now. 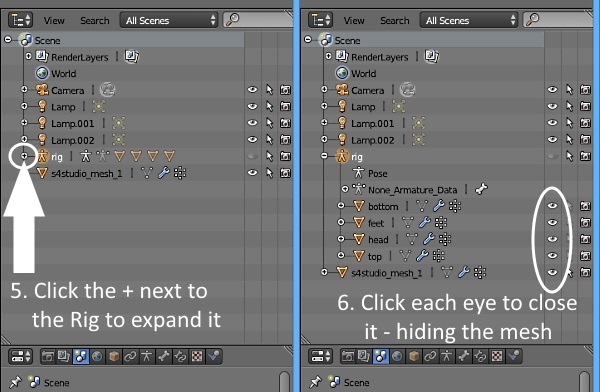 All the steps of this tutorial require you to be on the Studio tab not the Warehouse tab. Bah nevermind, I found it. In case anybody else has the problem, it's the tiny button at the bottom of the window that says "Proportional Editing Mode." I blame my tired eyes. But while reimporting to s4studio I got this error. Something with the tangent space/uv problem. But I have a uv map (done in another programm) and I have two uv sets, what am I doing wrong?